Norwest Business Park is a thriving business community strategically located in Sydney’s Hills District with direct access to Sydney’s orbital motorway system providing easy access to the CBD, airport and Sydney’s manufacturing and distribution heartland. The Business Park has grown to accommodate over 20,000 employees with expansion expected to increase capacity to over 35,000 employees. Norwest Association Limited is the body corporate established under the Norwest Master Scheme to maintain development standards within Norwest Business Park and to ensure on-going Park maintenance. Effective from Saturday 18 March, Brookhollow Ave will be closed for approximately nine months at the intersection of Norwest Boulevarde and Century Circuit. This closure is required to remove the temporary bridge beneath the western end of Brookhollow Avenue and allow the safe construction of the station underneath. All access to and from Brookhollow Avenue will be via the eastern end opposite Columbia Court. To maintain traffic flow from Windsor Road to Norwest Boulevarde, morning peak hour traffic restrictions into Brookhollow Avenue will be implemented. 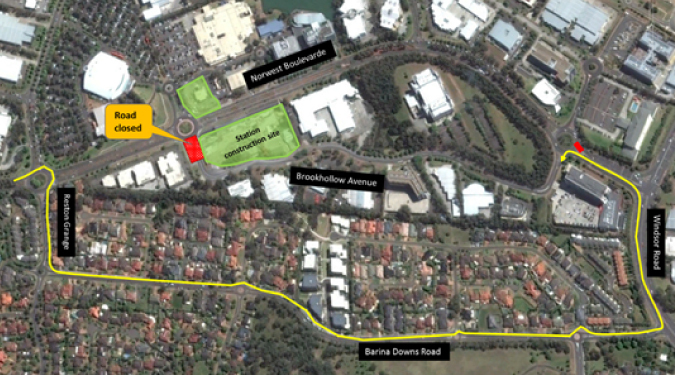 All access to Brookhollow Avenue will be left in from Norwest Boulevarde. There will be no right turn access during the morning peak period. Please refer to map below for more details. Traffic changes will continue to occur on Norwest Boulevard around the Norwest Station precinct as we continue to build the future station and create a signalised intersection at the Norwest Boulevarde and Brookhollow Avenue intersection. Drivers should plan for extended travel times, drive carefully through road work zones, follow direction of traffic controllers, adhere to reduced speed limits and follow traffic signs. © Copyright Norwest Association Limited.